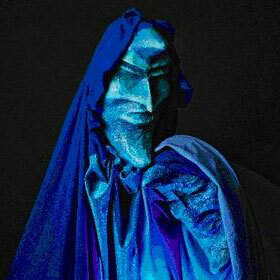 The Nativity Story is my adaptation of the Christmas story performed by actors and puppets, accompanied by live piano. 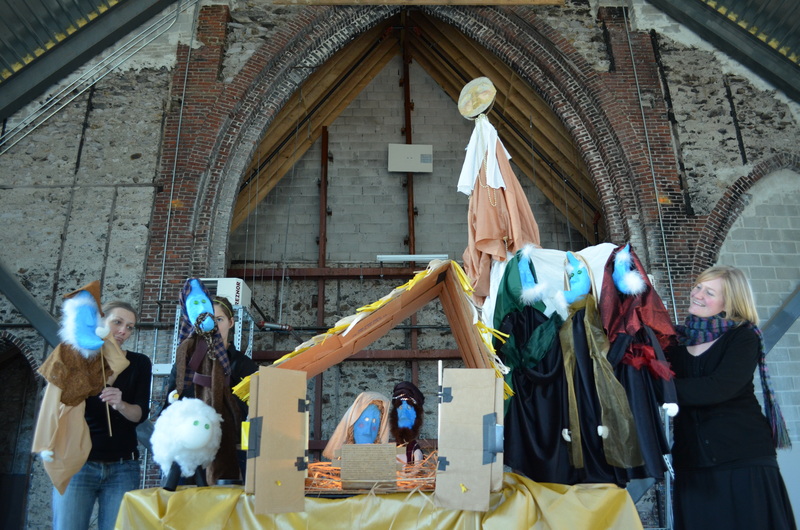 It was first performed as a work-in-process on Dec. 21, 2011, in front of a wonderful and willing crowd at the First Baptist Church in Jamaica Plain, and has gone on to a life touring churches in the holiday season. But how did someone proclaiming to be as non-religious as I find herself sculpting wise men and shepherds? A handfull of years ago I went to my very first Quest Theatre Ensemble performance. It was a show called Blue Nativity, and also told the Christmas story. It was one of the most beautiful things I had ever seen. On top of the power of the show itself was the fact that it was New Year’s Day. The person sitting next to me was still kind of drunk. It was entirely possible that a fairly large number of the under-25-ers in the crowd were still kind of drunk. It is also entirely possible that many of them weren’t even Christian. But they were THERE. At the theatre. At a theatre that was in a church. Being very quiet, and awestruck, and respectful. Seeing Blue Nativity stuck with me. Even after I left Chicago it lingered in the back of my mind. My first year in Boston I made it back to the Windy City to catch the Blue Nativity performance (every New Years Day at 4pm, like clockwork, for the last 10 years). But as years passed I did not, and found myself listless on New Years Day, pining for it.So what’s a theatre artist to do if she can’t go to the theatre? Bring the theatre to herself. And I set out to create Blue Nativity in Boston. test puppets… never meant to make it to the stage, but they did! At that point I was working for a church, and I asked around to see if there was interest in a show like this. Not only was there interest at the church, but friends were interested, other theatre artists were interested, even people I would have called “non-religious” were interested. Spurred on by the Playground gatherings (a venture from Boston’s Company One, designed to bring artists together to experiment with projects). 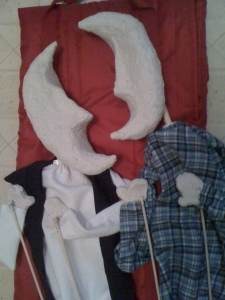 I put together some test puppets. They were messy and rough, made of newspaper and a sticky modeling compound called Celluclay, but slowly they developed personalities. The personalities and the characters started to mesh. The days turned into weeks, and the show was running forward on its own. Things came together fast. Before I knew it the show was listed as part of the church’s advent programming. There was a big sign in the lawn. There were singing rehearsals in the church attic. Two test puppets made in my kitchen turned into Mary and Joseph, and to them I added three Magi, one shepherd, one sheep, and one angel (Since that first year we’ve also added a donkey and an innkeeper.) We performed on December 21 to a full house of First Baptist members and friends, and a couple of people who walked in off the street. The applause and laughter were amazing. The feedback welcome, and helpful. The following year, in August, long before Christmas trees started to appear even in the most cheeky stores, I called a friend of mine who worked occasionally as a music director and asked her to partner with me on the show. Through the fall we met and strung the accompaniment together tighter. By October we had it more or less cast, and by the first week of November I was getting phone calls from people who had seen the first show or heard about it from friends asking if it could travel to them. And it did, and it does, and now I have a new adventure to look forward to every year, like clockwork.